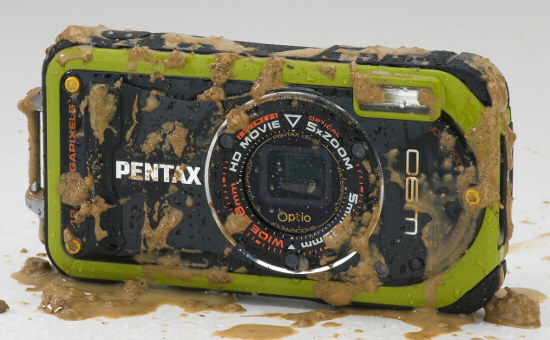 GOLDEN, CO (February 24, 2010)...PENTAX Imaging Company has announced the eleventh generation PENTAX Optio waterproof digital camera built for rugged adventure in every way. The PENTAX Optio W90 offers enhanced waterproof, shockproof, dustproof, and coldproof performance and features an inventive Digital Microscope mode with LED lighting to capture small but intriguing subjects. Designed with the look of mountaineering equipment, the Optio W90 kit includes a woven web fabric strap complete with a carabiner to attach the camera to a backpack and other outdoor gear. Adventure photography doesn't get any better than this. The rugged Optio W90 offers photographic performance, innovative features and style that surpass other outdoor compact digital cameras now available on the market. PENTAX Imaging Company is an innovative leader in the production of a variety of digital cameras including weather resistant digital SLRs and stylish, compact, waterproof cameras, as well as lenses, flash units, binoculars, scopes, and eyepieces. For 90 years, PENTAX has developed durable, reliable products that meet the needs of consumers and businesses. With headquarters in Golden, Colorado, PENTAX Imaging Company is a division of PENTAX of America, Inc.